Jerome Powell, the Trump-appointed Chair of the US Federal Reserve, spoke to the National Association of Business Economists (NABE) yesterday. He told the assembled mainstream economists who work for big business in the US that the US economy is strong, with unemployment near 50-year lows and inflation roughly at the Fed’s 2% rate objective. So the Fed was going to continue to ‘normalise’ monetary policy by raising gradually its policy rate over the next year or so. The NABE held its conference in New York at the same time as the Union of Radical Political Economy (URPE) was holding their 50th anniversary conference in Massachusetts. I have already reported on some of issues that URPE participants discussed. But it is interesting to compare what mainstream business economists thought were the key issues to consider. First and foremost was the issue of trade. Was Trump’s protectionist ‘trade war’ with America’s trading ‘partners’ (rivals?) going to lead to disaster for the US economy? The keynote speaker was Dani Rodrik, Ford Foundation Professor of International Political Economy, Harvard Kennedy School and author of, Straight Talk on Trade: Ideas for a Sane World Economy. Rodrik was an interesting choice because he has been prominent in arguing that ‘free trade’ is not always the most optimal and best policy for national capitalist governments to promote. With free trade, not everybody is a winner and many are losers. Rodrik made this argument at last year’s mainstream conference of the American Economic Association (ASSA). It seems that, since the Great Recession and the slowdown in world trade growth, ‘free trade’ and globalisation are now being questioned as the only way forward for American capital. Big business economists are looking for an alternative economic theory to back protectionist policies. So there were several sessions on this issue dealing with NAFTA and the impact of protection on manufacturing. Other subjects discussed at NABE included behavourial economics (rising again as a possible alternative to the failure of neoclassical equilibrium theory); climate change and global warming; the property, transport and retail markets. 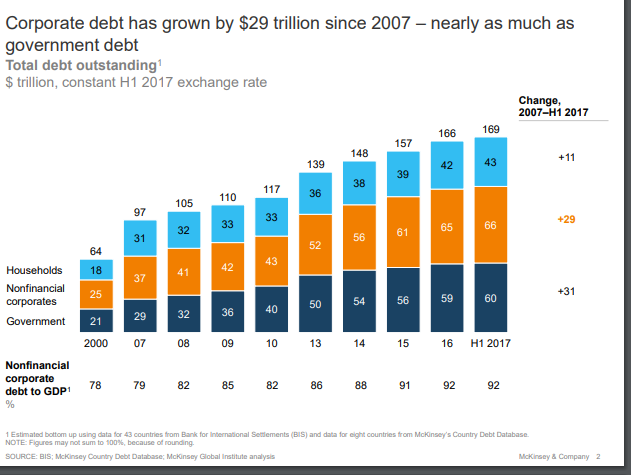 There was considerable concern about rising debt post the Great Recession, both globally and within the US. One session was entitled, Corporate Debt, Student Loans, Auto Loans, or EM: Which is the Next Subprime?, Lund in which Susan Lund from McKinsey reiterated the consultancy’s research on global debt, pointing to rising corporate debt as the real worry for the next crash – something that I have also focused on. Some presentations considered the problem of low productivity growth in this Long Depression since the end of the Great Recession. Could the digital and ‘knowledge’ based sectors of the economy turn things round to sustain growth? Many were confident that US capitalism would take advantage of new technologies to restore productivity growth to near previous levels. With the December 2017 rate hike by the FOMC, the fed funds rate hit 1.50% and, hence, this FFR/10-year threshold was met (the cycle low for the 10-year bond yield is 1.36%). This suggests that, starting in December 2017, there is a 69.2% chance of a recession during the next 17 months (average lead time). They also found that the cumulative effect of Trump’s tax cuts on this recession call was insignificant. Bu, higher tariffs and a trade war could speed up a recession. 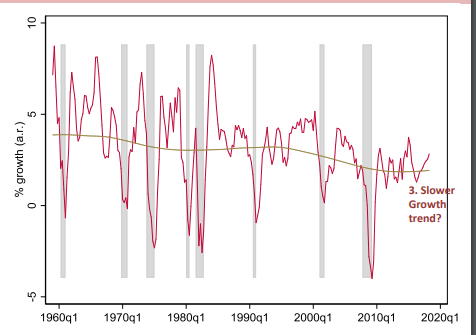 So it’s a near 70% chance on this indicator that there will be a new slump in the US by summer 2019. That’s much higher risk than the NABE members think. This entry was posted on October 3, 2018 at 11:41 am and is filed under capitalism, economics. You can follow any responses to this entry through the RSS 2.0 feed. You can leave a response, or trackback from your own site. Bond yields are so heavily manipulated due to QE that any analytical usefulness they might have had is now gone. Moreover, given that the US 10 Year has gapped higher to 3.24%, and other global interest rates are rising along with global growth, and as US employment numbers, ISM surveys etc. continue to strengthen my bet is that this predictor will be wrong also.